Check out this new Key Stage 2 Neil Armstrong and the Apollo 11 moon landing lesson plan. The lesson is also available as a slideshow with full teacher notes here. History: Neil Armstrong is one of the most significant individuals in history who has contributed to international achievements by his landing and walking on the moon. The landing of Apollo 11 was a very important historical event in its advancement of our exploration of space. 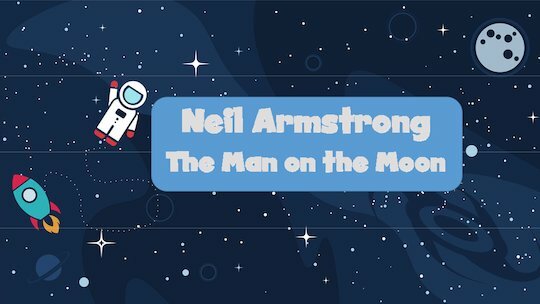 Teacher led discussions about the story of the first man to walk on the moon, will encourage children to ask questions and understand the importance of this event. Geography: Using atlas’s and globes to check on the location of the launch and recovery sites of the Apollo mission will encourage their interpretation of geographical information, such as maps. Discussing the formation of igneous rocks found on the surface of the moon will help their understanding of its geographical features. English: Composing their own messages to leave on the moon will develop their ability to structure and sequence sentences. Identifying and using a range of adjectives to express emotions of loneliness, will encourage an empathy with characters, both real and fictional, and develop their descriptive vocabulary for spoken and written language.